An Eritrean migrant was caught hiding inside a suitcase after terrified train passengers heard moans coming from the bag as it entered Switzerland. The six-foot man had squeezed himself into the case and was wheeled onto a train in Milan, disguised as his friend’s luggage.But the discomfort took its toll after 45 minutes, causing him to wail as the train crossed the Swiss-Italian border. Shocked passengers alerted authorities after hearing strange noises coming from the unattended bag. Guards removed the case from the train at Chiasso and were stunned when a human hand emerged. 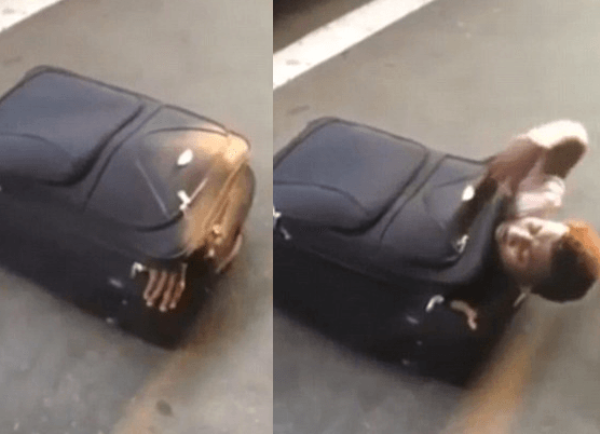 They filmed the astonishing moment the migrant reached his arm out of the case and then wriggled his head free. He struggled to undo the zip on the station platform so guards had to free him, before grabbing him as he stood up. His friend was found hiding in the train toilet. The authorities were already aware of the migrants and planned to stop the train even before passengers heard the moaning. ‘We received a call from Italian colleagues that two Eritreans were attempting to get into the country and travel northwards across Europe to Britain. The men, travelling without documents, were sent back to Italy. This is not the first time inventive migrants have been caught packed into small spaces. In March Spanish border police found three migrants hidden away in compartments inside and underneath a car. The three men, aged between 20 and 22 and from Guinea in West Africa, were found trying to cross the border into the Spanish territory of Melilla, a city in northern Africa. Spanish border police discovered one of the youths in a special compartment built underneath the boot, while the other two were wedged underneath the dashboard.